Mountain Time Arts commissioned thirteen regional artists and designers to create installations in storefront windows on Main Street in downtown Bozeman, Montana. Each artist collaborated with a conservationist or scientist for these research-based interdisciplinary projects about water conservation. The UPSTREAM installations inspired pedestrians who traveled Main Street in Bozeman to think about their own relationship to water conservation and usage. Removers, Fixers illustrates bacteria that removes toxins from wetlands soil and water. These functional groups are used in bioremediation to clean the environment. Brink’s video What We Remain… parallels the different phase changes of water (solid, liquid and gas) with the phase changes of human development. Jenny Hale with Laura Ziemer of Trout Unlimited and Brian Heaston from the City Public Works Dept. Hale used photography and illumination to highlight the Valley’s water system and the idea that surface water and groundwater are one and the same resource. Red Star works across disciplines to explore the intersections of Native American ideologies and colonialist structures. Raised on the Crow reservation, Red Star is an avid researcher of archives and historical narratives. Her photographs are inquisitive, witty and unsettling. Forest to Faucet is based on our forests as sources of water supply. The project incorporates discarded chipboard materials from construction sites and uses water-based washes. All of the materials will be recycled into future sculptures. Rudolph looks at the psychological attachment to ritual activity in domestic spaces. She combined industrial and domestic materials to create a project that speaks about functionality in the home in relation to Bozeman’s watershed drainage. Behrle using eight quilt block patterns as a framework, created moving images of layered video shot in seven locations in the Gallatin Valley from Hyalite Reservoir to the Headwaters State Park. Janzen’s painting used two sources of visual information: images of the running creek, and the numbers, colors, and lines seen at Bozeman’s water treatment plant. The ‘natural’ world of spring flow joins the ‘scientific’ realm of filters and labels as the water is treated for human use. The installation had viewers peer through constructed portals and were invited to visualize the ways in which surface water is connected to the aquifer. Rabel’s paintings visualize the speed of water as snow melts into the rivers. The colors denote the purity of the water in spring runoff. The work strives to suspend the speed of change in an object for a moment, to reveal the fleeting shape before it moves on. Using mixed media and print advertising to construct narratives about social and environmental concerns, Petersen merged concepts of surface and ground water with the history of signage and print advertising. 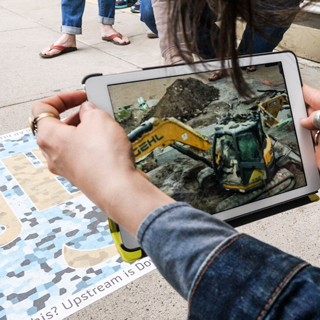 The Running Wolfs used augmented reality to reveal water systems under Main Street. They worked with the City of Bozeman to locate and understand the function of the infrastructure. Michael Running Wolf’s AR app was downloaded over 2,600 times during the project.